I have seen Hoder from a distant in Budapest past summer. 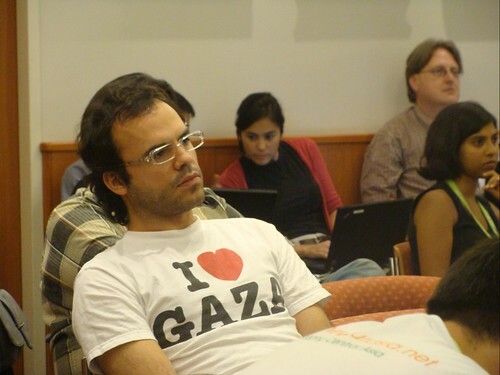 He was wearing a “I heart Gaza” shirt. He is in jail now, his family has confirmed, if he wasn’t in jail he would have gone mad on his laptop at the Zionists’ war crimes in occupied Palestine. I don’t know the guy very well, but after Budapest I added him on Facebook, and HezbAlla was celebrating Samir Kuntar’s freedom. I was there in Southern Beirut (Dahiyah) and I took some pictures and added them on my Facebook and my blog. He posted the album on his Facebook as well and he had a fight with one of the friends on my list who was calling HezbAlla an extremist group. After posting that album, Hoder linked to my blog on his Persian blog, I was blogging in Arabic then. Hoder is a good person, he may have done mistakes in the past, but I have met him when he had thought things over, he made a huge LEFT turn, he joined the path of resistance, now he’s in jail. The godfather of the Iranian blogsphere is in jail and no one is doing anything. I am not Iranian but Iran concerns me. Most importantly, Hoder matters, he is not going to stay in that cell of his, he is going out and he’s going to give me that “I heart Gaza shirt” of his. This is me signing the petition. We, the undersigned, view the circumstances surrounding the Iranian authorities’ arrest of Hossein Derakhshan (hoder.com), one of the most prominent Iranian bloggers, as extremely worrying. Derakhshan’s disappearance, detention at an unknown location, lack of access to his family and attorneys, and the authorities’ failure to provide clear information about his potential charges is a source of concern for us. The Iranian blogging community is one of the largest and most vibrant in the world. From ordinary citizens to the President, a diverse and large number of Iranians are engaged in blogging. These bloggers encompass a wide spectrum of views and perspectives, and they play a vital role in open discussions of social, cultural and political affairs. Unfortunately, in recent years, numerous websites and blogs have been routinely blocked by the authorities, and some bloggers have been harassed or detained. Derakhshan’s detention is but the latest episode in this ongoing saga and is being viewed as an attempt to silence and intimidate the blogging community as a whole. Derakhshan’s own position regarding a number of prisoners of conscience in Iran has been a source of contention among the blogging community and has caused many to distance themselves from him. This, however, doesn’t change the fact that the freedom of expression is sacred for all not just the ones with whom we agree. We therefore categorically condemn the circumstances surrounding Derakhshan’s arrest and detention and demand his immediate release. Absolutely believe no one should be locked up for writing! That said, I often wonder about Hoder. I thought many of his activities were a disgrace, such as accepting money to be the guy to show around in Israel, as well as some of his other antics. I have never met him, so I can’t judge, but he is one of those who makes me really wonder. If he made a turn, who is to really know. Surely, being imprisoned for his thoughts or writing, whatever they may be, is wrong. I wonder what are his news. Any updates? Nothing from my part. I hope he’s still..alive.